A 16-foot mountain of secondhand clothing, towering over Hong Kong’s Central Star Ferry Pier, is a sight to behold. But the white-peaked behemoth, designed to illustrate the Chinese territory’s textile waste, is just the tip of the precipice. The equivalent of 7.5 tons of textiles, the “3% Mountain” is only a percentage of the 253 tons of clothing Hong Kong residents throw away on average each day, according to the Environmental Protection Department. Part of the “Get Redressed” exhibit last week, the “mountain” of used garments (and the occasional stuffed animal) spanned the breadth of an entire football field. “Most people don’t realize that Hong Kong has over 190 used-clothes recycling banks where they can donate their unwanted clothes and textiles for recycling rather than sending them to landfills,” says actress Carrie Lam, an ambassador for Redress (née Green2Greener), the nonprofit that organized the event with appliance company Miele. Of the more than 92,000 tons of textiles abandoned in landfills in 2009, 71 percent originated from domestic sources. Clothing sales have soared by 60 percent in the past decade, according to Hong Kong’s EPD. Of the more than 92,000 tons of textiles abandoned in landfills in 2009, 71 percent originated from domestic sources. The former British colony recovered roughly 15 percent of the waste, compared with 33 percent in the United Kingdom the same year. Great site! Found you through FB Rachel Starkey. & Here we all thought the US was the #1 source of waste! Everyone I know donates their usable used clothing--only the nastiest undies go to the compost bin or landfill. A 16-foot mountain of secondhand clothing, towering over Hong Kong's Central Star Ferry Pier, is a sight to behold. But the white-peaked behemoth, designed to illustrate the Chinese territory's textile waste, is just the tip of the precipice. 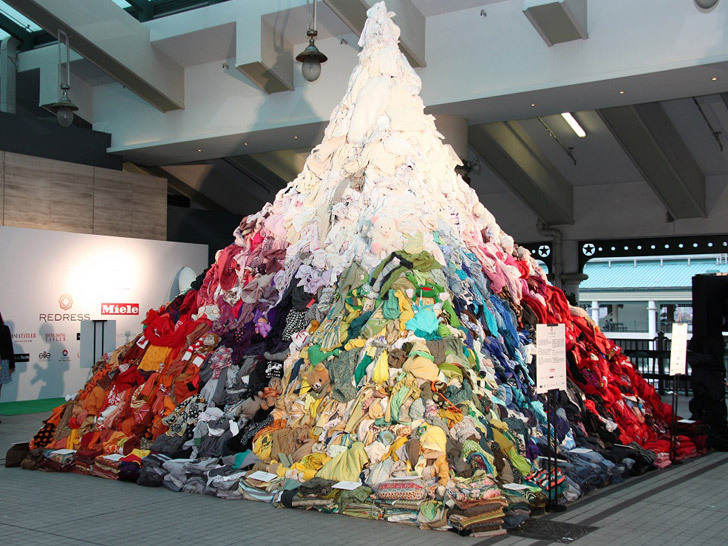 The equivalent of 7.5 tons of textiles, the "3% Mountain" is only a percentage of the 253 tons of clothing Hong Kong residents throw away on average each day, according to the Environmental Protection Department.